Are Life Sciences a Goer for Greater Birmingham? In the quiet of the early summer holidays the Greater Birmingham and Solihull LEP (GBS-LEP) published with little hoohah the report of the Silk Commission on Greater Birmingham’s Life Sciences sector. This was a much needed independent look at the potential of growth in this sector in Greater Birmingham. Life Sciences have often been touted as an important future sector for Greater Birmingham/The West Midlands. Indeed Health and Medical Technologies were identified by Advantage West Midlands as an ‘aspirational’ business cluster in its Regional Economic Strategy as long ago as the early 2000’s. Before going on to look at the Commission’s recommendations it is worth looking at it as a model for future policy development and the work that has gone on up to now by a variety of partners to get the city region to a stage where it is credible to talk of the potential of Life Sciences as an economic driver. 5 years ago this would not have been possible. Firstly let’s look at the Commission; this was a wholly independent commission unlike the Smart City and Green Commission’s instigated by Birmingham City Council in recent years. These latter commissions which I believe are still ongoing are chaired by the Council and involve a range of partners. The Life Science’s Commission was produced by Graham Silk with support from GBSLEP. He is a chairman of a venture capital firm but has personal reasons for his interest in the area. He held various meetings and people and organisations submitted evidence – he was I understand the person that digested all the information and wrote the report. This approach has led to detailed recommendations from someone who is obviously knowledgeable and committed to the agenda but perhaps it could have benefited from a wider authorship/ input? I will come back to this later. Where is the city region in terms of its Life Sciences profile. A research report from 2013 on various sectors and regional strengths which particularly focussed on Universities role in Growth entitled The Witty Review gives a brief overview. In terms of concentrations of employment the map below shows that Life Sciences employment is fairly evenly distributed over England with no real hotspots. The darker the blue the more concentrated employment is in the LEP area concerned. It shows however that Greater Birmingham’s employment in Life Science’s is only marginally more than the average for England and surrounding LEPs are below average. These figures show an improvement over 2008 figures where none of the local LEPs had above average figures. It also ranks Universities by their research output in the various sectors. The map/table below summarises the results for the Life Sciences by LEP area. 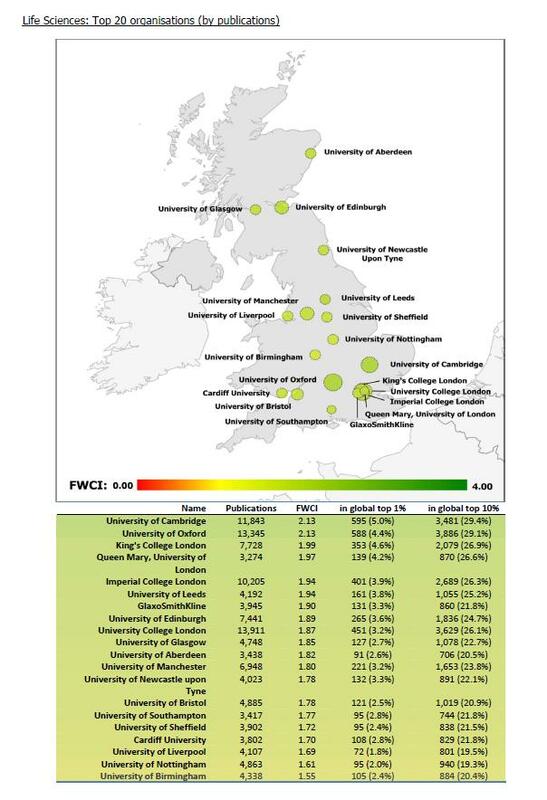 This shows again a relative weakness of the area in terms of research in Life Science with our only local University to rank in the list coming in last at 20th. Now we must take these figures with a pinch of salt. They are broad brush and do not capture everything. Now this post is not intended to paint a definitive picture on the statistics behind Life Sciences in Greater Birmingham but it seems safe to say we are relatively strong in medical technologies but Life Sciences is made up of a number of other sub sectors in which we probably are not yet strong. So it is fair to conclude we are probably still aspiring to have a significant Life Sciences sector. The Salt report however draws out the reasons to be hopeful for the future. It stresses the recent investments that have been made. It is these investments by partners that have got the city region to the stage of potential take off. Notably these investments have included. The Institute for Translational Medicine. This facility that drew £12m investment from Birmingham’s first City Deal is due to open around now and will focus on improving and creating new treatments, providing a place where clinicians can work with SME’s and other Life Sciences companies. 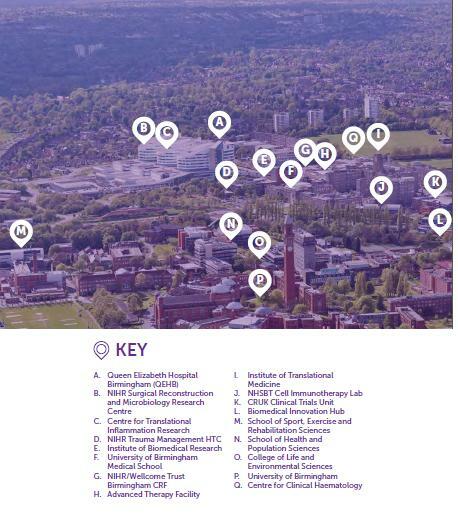 There is a useful summary document that outlines the potential of the ITM – download here and the following graphic drawn from the document succinctly shows the strengths that exist in a very small geographic area around the University of Birmingham and the Queen Elizabeth Hospital. Interestingly it doesn’t list all the potential assets. The Salt Report adds to the list of assets. The BioHub. This recent £6.8m project part funded by Europe has a strap line ‘transforming biomedical innovation into enterprise’. Based at Birmingham Research Park it provides space and lab facilities for start ups in the Life Sciences sector. The planned Life Sciences Campus. This latter project that has won initial funding of £5m from the 2014 Growth Deal. It is envisaged that this will provide a Science Park specifically for life science businesses, capable of supporting over 400,000 sq ft of office space, including laboratories. There is mention as well of the strengths in Digital Healthcare in the city and the investment in ICentrum which will focus in part on promoting the growth of this sector. So apart from the physical and intellectual assets in place and planned the Salt report outlines what the Institute for Translational Medicine sees as a major asset for the city region. The accessibility of a large hugely diverse patient population is seen as a key asset for developing clinical trials. The report outlines why with the move to more personalised medicine that clinical trialling will become even more important than it is currently and Birmingham has real potential. The report summarises the advantages of the Greater Birmingham area. It notes that the lack of provision of private funding is holding back the development of models for early phase patient trials. It notes an absence of public sector funding for a central hub and for research nurses in partner hospitals blunts delivery. Partnership with other locations – eg Oxford. There are numerous other recommendations and the above is just a flavour.. What the Salt report doesn’t really look at is the real importance of the Life Sciences Campus and who and how that will be delivered. This to me points to a slight flaw in it as if it had a wider authorship these issues might have been better covered. The BioHub together with the ITM should hopefully create a lot of start ups but they will need space to move on to as well as inward investing firms will need space to move into. The key role in delivering this space cannot be overemphasised. This is where Birmingham City Council, the University of Birmingham and the developers will need to work closely together. This can not be a solely property based development. The Innovation Centre in Longbridge is an example of where property based developments really only deliver nice new office space – but do not seemingly deliver on Innovation. What is need is a much more directed and networked approach as being followed at Innovation Birmingham in developing Birmingham’s digital sector. There is if the Life Science campus is developed well the real potential in South West Birmingham to develop an Innovation District where Property/Academic and Health assets are closely co located for the benefit of all and the city region. The City Region has continued the focus on Innovation. In the draft West Midlands devolution deal leaked recently significant emphasis is placed on growing innovation in the area with reference in part to some of the asks in the Salt report for Life Sciences. We await the outcome of those negotiations. A real focus on getting the trialling and research around that properly funded! I would add that it also needs the property side to deliver the space necessary for such un-tapping and for us to move beyond just being aspirational.